First of all, let me say how excited and honored I am to be featured at East Coast Creative today. I very recently became aware of Jess and Monica's super-creative blog by stumbling across "Creating with the Stars", and now am so happy to be following along with all of their projects! They were kind enough to highlight my green china cabinet today, and I know you'll love looking around! 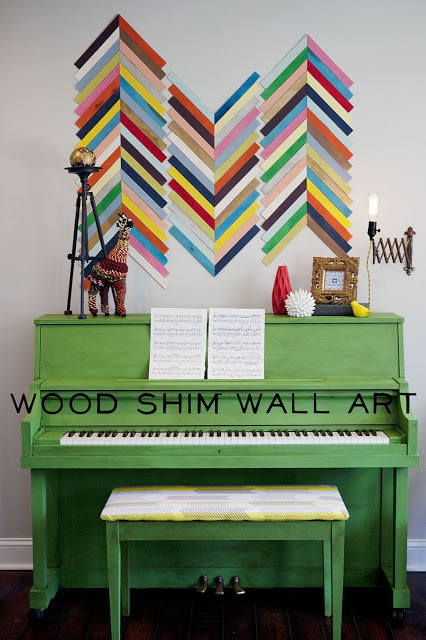 And, they're in a little contest of their own right now...where this amazing Wood Shim Wall Art is their entry. Isn't that so much fun!? Of course you know I'm partial to the piano too. The prize in this contest is $5,000 to the charity of their choice, which is Worthwhile Wear. This company works to rescue victims of human trafficking and help restore their lives through providing vocational training. This is a HUGE problem worldwide, and yes, even in the United States I think it's a tragedy that not many people acknowledge. If you have a minute, please go read about the project and the charity here, and vote! Thanks again to Jess and Monica for having me over today! Well, I didn't get what I had hoped done in Caleb's room last weekend, between a soccer game and baseball tournament and church activities our weekend flew by! However, I do have one little project completed to share with you today. We did come home from Ikea with the large Expedit shelving unit, and I hoped to fill some of the lower compartments with baskets for hidden storage. I selected one of the natural colored cube baskets at Ikea that fit perfectly in each section, but wouldn't you know they only had 4 of the color I wanted. I needed at least five, and would have planned for more but at $13-15 each, those things were really adding up on top of the initial cost of the shelf. So, I left with no baskets and hoped to find something that would work when we got back home. I found several options at Lowe's and Hobby Lobby to try out, but the one that fit the space the best was from the grocery store of all places, and $4.99 to boot! I scooped up 5, and by the time I decided that I wanted 5 more about a week later they were completely gone. Hoping that they might get more some day, but at least we have a start. So, the price was right, and the color will go nicely with the new plan, but these aren't the best looking baskets in the world...just a little plain. I decided that some labels were just the thing they needed. 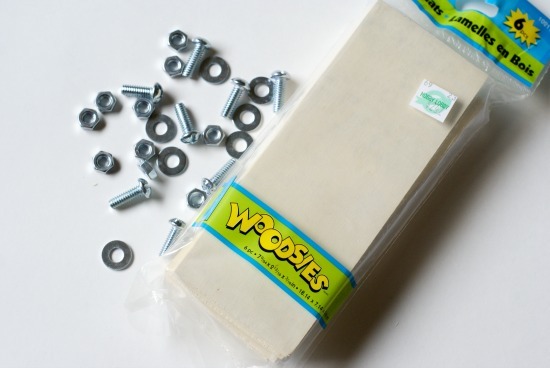 At Hobby Lobby I found this package of pre-cut ready to go wood strips, and picked up bolts and washers to attach them. I used a larger bolt size-1/4 20 x 3/4". 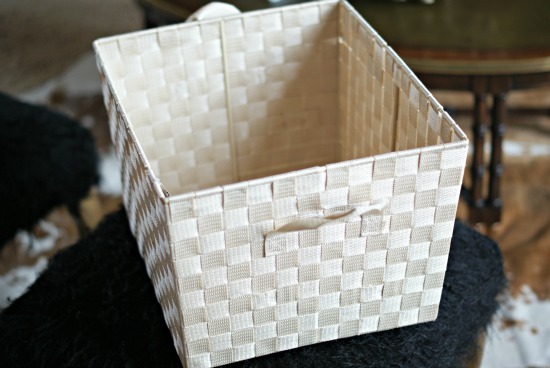 When marking where to drill the holes, I was careful to find a place where the woven bands on the basket intersect, so I could just push the bolt through that corner and not have to alter the basket in any way. 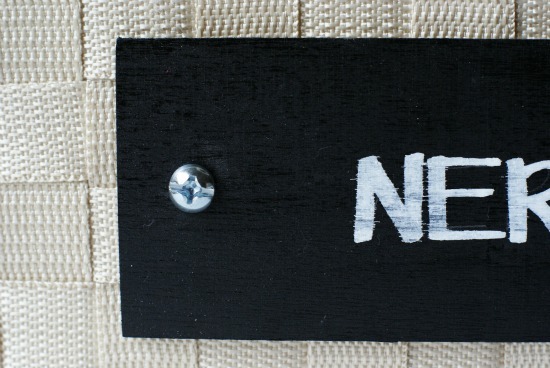 At first I thought about doing chalkboard labels, but I didn't have any chalk paint on hand and didn't really plan on changing out the words, so I just quickly sprayed them black and used a white paint pen for the letters. Then, it took two minutes to thread the bolt through the wood and the basket, and attach a washer and nut to the back side. I like the hint of an industrial look that the bolts add to the basket. Don't forget to stop by and visit East Coast Creative! Get the heck out. I don't know if you've seen my IG pictures from a long time ago but I saw a fashion window by JCrew a while ago and they did something similar. I so wanted to do something like this. They beat me to it. Darn it. But I love it! i love that wall, too! so cool! 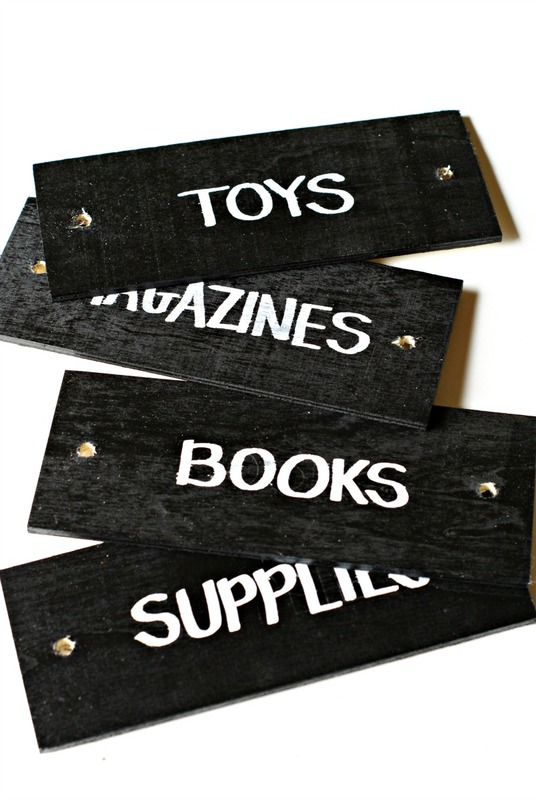 and your labels look fabulous! Looks great!! You have the best ideas! Congrats on the ECC feature! 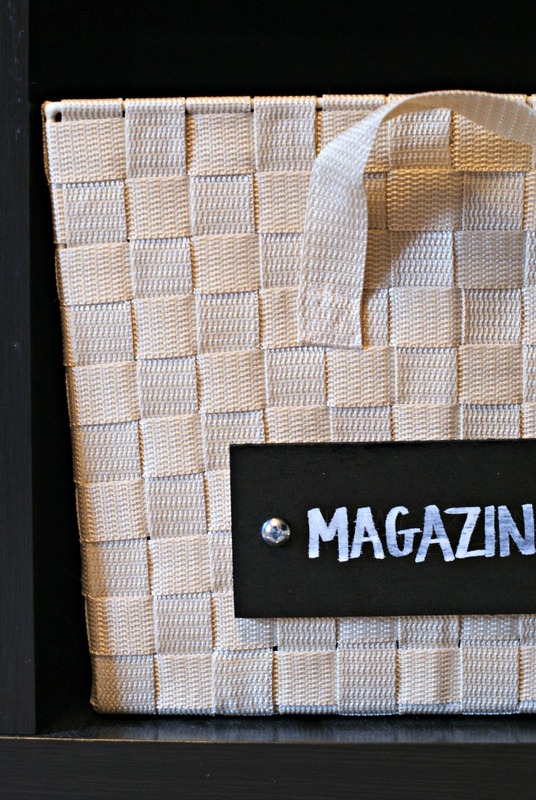 And I love the labels....using the bolts is brilliant and gives it a total industrial vibe. I just saw your china cabinet over at ECC and I'm totally in LOVE! I seriously have been in search for that exact piece haha... I might have to replicate it :) also what is the fabric on the back if that chair? Loving your creativity and organization! They look great with the labels! Congrats on your feature!! :) Those bolts are such a cool detail, and the organization, gotta love it! I found you via East coast Creative. I'm so glad I did! The cabinet looks super in green! How perfect do these look! You never seem to run out of fabulous ideas!! The baskets look great and I loved seeing that gorgeous green cabinet over at ECC today! Awesome! 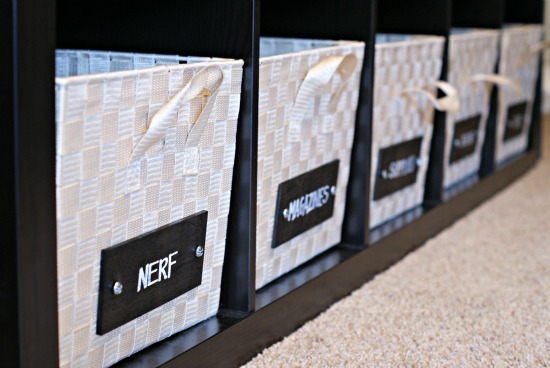 Such a unique idea with the basket labels. Girl, you know your nuts & bolts! :) I would never think of that and it's so clever.